Today was extraction day. Meagan and I went out at about 12:30 and began the long process of pulling honey from the hives. All total we ended up with 7 supers full of the golden nectar. It was a hot day today, with temperatures in the upper 90's. Whew we were beat by the time we came in... and we were only 1/2 way done. 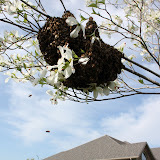 Once we got all the bees removed and the boxes brought up to the house, we took the blower to get rid of the rest of them. Well, at least thats what we thought... Even after blowing the bees out and giving a quick check of each box just to be sure, we still had about 15 bees sneak into the house with us on the supers. But the good news was out of 7 supers we only found 4 hive beetles. That was really good! I have heard horror stories of the little buggers being everywhere when going to extract. 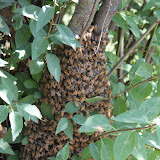 While we were in the the bee yard we also did a couple of hive manipulations. Reversing some boxes, putting frames in those that needed it and we also created a NUC out of a queen that was doing poorly. Why would I creat a nuc with a poorly performing queen you might ask?? Well the answer is simple, observation hive... I took some of her old brood and all of their stores and created a split of one of the MH hives. This old queen that is not performing will be great to keep a couple fo fmames going for observation hives and I can even take her along for the ride. That way when the kids want to see the queen, we will be able to show her, and if she happen's to accidentally get killed in the process, it would be such a loss. So as evening rolled in we began the extraction process. It took all evening... I was warned by my friend Val that it didn't matter if you were extracting 4 frames or 100, the process still took just as long. Why is this??? Well there is this crazy thing called setup and then this other very strange behavior called clean up. We extracted just under 70 frames, and the knife I used worked well, but maybe for my birthday or Christmas I will get a hot uncapping knife and that will make the process faster and easier. Hope you had a great day!.